July 7, 2015 The fourth session of MAPS for summer 2015 has been completed, wet and muddy from torrential rains in the area. One net needs to be set high and over water but has been surprisingly fruitful. At present, the mosquitoes are taking all of our attention when we sit still at the table to band! There have been 49 new birds caught and 33 recaptures. 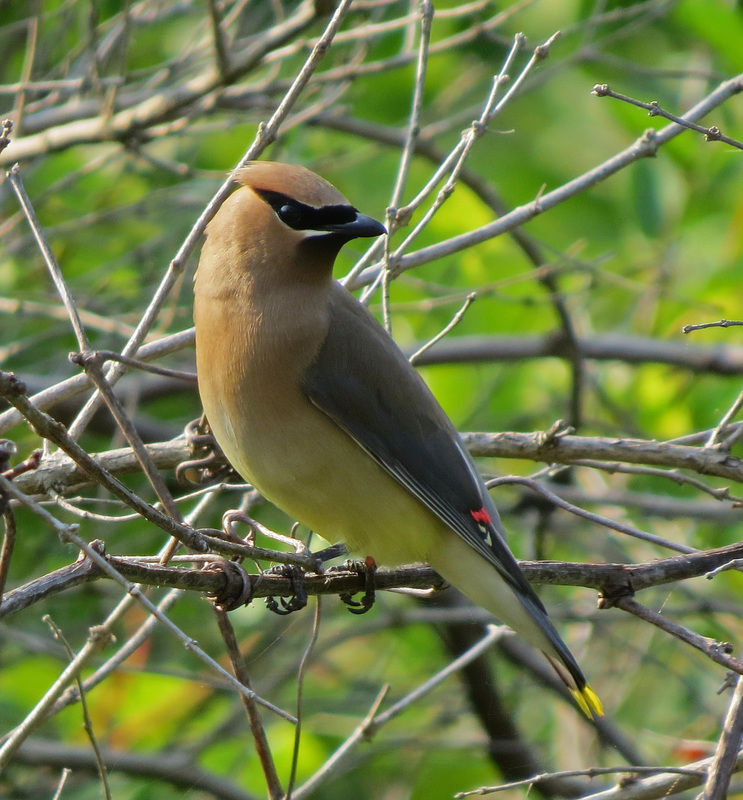 The new birds are mainly Yellow Warblers, catbirds, and Cedar Waxwings. 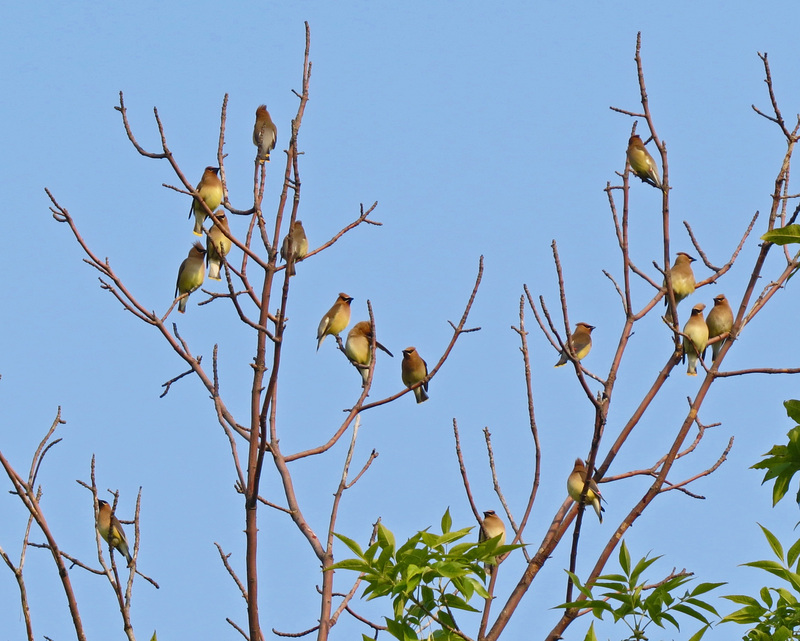 The Cedar Waxwings are really putting on a show. They congregate in large numbers across the road in a dead tree and in groups of 3-5 fly off to feed on berries of the honeysuckle on the other side of the road. A surprise find was a Cedar Waxwing nest occupied by the female with the male on a branch near her. Barely able to fly, fluffy and cute, the Yellow Warbler young are making their appearance. No catbird young have shown up yet. The MAPS area is showing a big change in vegetation as the green ash, maples and new plantings of trees are taking hold of open areas. Deer footprints occupy every net lane and pathway and several deer can be heard sloshing through the swamp reacting to our approach when we set up nets. The last three sessions of MAPS will probably show a plethora of young and then the rapid decline of numbers as all prepare for migration. Another hardworking crew of volunteers at High Acres Nature Area (HANA) had a very good MAPS banding session at on Friday, July 3rd. 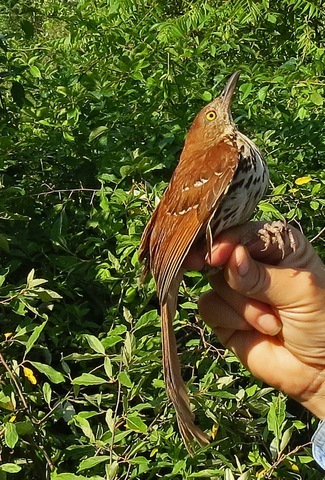 Twenty nine new birds of 12 species were banded and eight recaptured birds were processed. The Gray Catbird was the bird du jour, with 9 banded. Hatch year Yellow Warblers were also common (five new birds). Of special interest were an Eastern Wood Pewee and a Brown Thrasher (see photo). The volunteers were Aggie Windig, Jim Saller, and Gayle Lazoration. Brown Thrasher. Photo by Jim Saller.